In the back-to-school preparation frenzy, art education is the last thing on many, if not most, teachers' minds. And yet, what could be more fun... and even relaxing... than a little art during the first week of school? Best of all, teachers can find out a lot about students' fine motor and other skills, as well as their work habits and level of responsibility and concentration. One of my favorite things to do as an art teacher was to start the year with a little multimedia exploration. I set it up like Kindergarten stations, with four different media on four different tables for 1st and 2nd graders, and 3 different media on 3 tables for Kindergarten. Students started in one place and took their papers with them to the next station and added to their design. 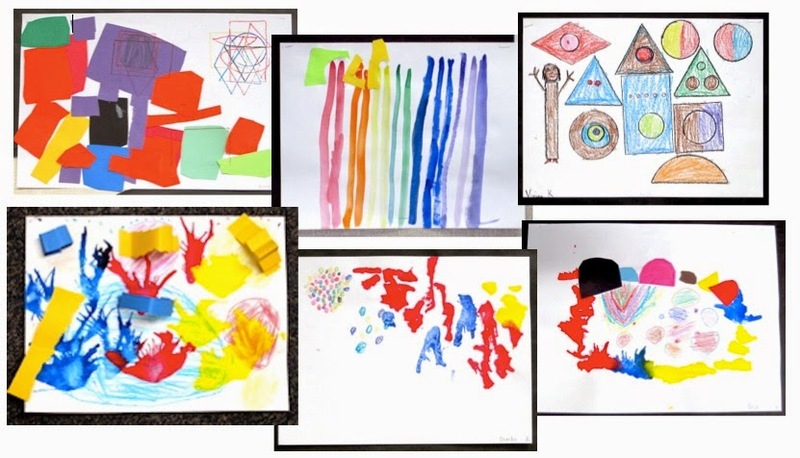 Kindergarten students used the same paper for the whole exploration, while 1st and ends used two sheets of paper, mixing two media on each paper. It took a little extra thinking to decide in which order to arrange the stations for rotation, because each group of students started with a different media, and I wondered how feasible it was going to be for those who started at the paint table. In the end, I decided to just not worry about it and see what happened. Before starting the activity, I quickly introduced the materials at each station and explained the procedure, including making a point of explaining to students that they would keep the same paper when they moved to a new station. Other than that, I didn't really give any earth-shattering directions, because I really did want this to be an exploration. An interesting side benefit of this activity on our first meeting day was that it gave me an instant overview evaluation of important skills: use of scissors, glue, and brushes; painting technique development; pencil and crayon grip; and fine motor and eye-hand coordination skills. It even revealed what kind of sense students had in putting together a composition, including whether or not they thought about what they were doing. It was especially interesting to see some students just start cutting shapes and gluing them on the paper at random, while others would spend time arranging their shapes just so while gluing, or giving slow, thoughtful attention to how and where they applied paint to paper, or how they lined up shapes for tracing. For those teachers and administrators who think art is just an extra for random Friday afternoons before vacations, I propose that there is much to be learned, by students and teachers, when children make art. Teachers can learn much about individual students' fine-motor skills, spatial sense, responsibility, and more, and students can learn how to develop concentration, practice motor skills, and more.... not the least being able to express themselves and create a little beauty for this world. So.... how about starting the school year with a little mixed-media exploration? My store at TeachersPayTeachers has lots of art lessons for teachers who don't have art background. This mixed media exploration is included in the bundle Start With Art, and you'll find a couple of free art lessons, too! Check it out! Rene, I love how you make it easy for those of us with out training or confidence to provide real art lessons with our students! Thank you!